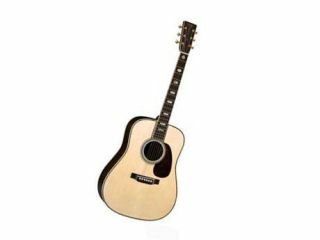 NAMM 2011 PRESS RELEASE: The new D-45 Authentic is made exactly like Martin made the original 91 pre-war D-45 Dreadnoughts. And like the originals, these new D-45 Authentics could well become the next "Holy Grails" of acoustic guitardom. These are magnificent, historically correct instruments, scrupulously replicated based on a 1942 D-45, the centrepiece of the Martin Museum Collection. According to Tim Teel, Martin's Director of Instrument Design, pre-war D-45s had some interesting differences from later D-45 reissues. The original Adirondack red spruce tops were thinner (.105" versus .120") with rear-shifted scalloped X-bracing. The thickness of the back was slightly thinner, too, which also added to the lightness and airy resonance of the guitar. We've reproduced these specs in this Authentic edition along with an ebony, non-adjustable neck rod (circa 1930s), solid pearl inlays and, of course, premium bookmatched Brazilian rosewood back, sides, headplate, as well as Brazilian inlays in the top, rosette, side and back, and much more. Perhaps one of the most important authentic features of the 1942 D-45 is the 100% hot hide glue construction. For many years, hide glue was used almost exclusively by Martin and other quality guitar makers. It's still the choice among many independent luthiers - and with good reason. A natural-based product, it's been proven to add sustain and clarity of tone to guitars and other stringed instruments. Although it is extremely difficult to utilise in production settings, it does allow for easy disassembly of wooden parts in repair procedures. As many vintage instrument collectors and repair persons can attest, hide glue is durable, flexible and long lasting. At Martin, we still use it on many of our custom instruments and vintage guitar repairs. Other authentic features include bevelled faux tortoise pickguard (under lacquer), ivoroid binding on body, soundhole rosette, fingerboard, headstock, heel cap and end piece. The old-style gold tuners are featured, too, as are the traditional ebony bridge with fossilized ivory bridge pins, long saddle and nut, ebony fingerboard with 45-style hexagon fingerboard inlays. A thin nitrocellulose polished lacquer finish completes this faithful reproduction. If it was on an original pre-war D-45, it's on the new 1942 D-45. All of these features and attention to minute details coalesce into more than just a historically correct D-45. These guitars replicate the feel, the sound, the look, the essence of a pre-war Martin D-45. Welcome back to the really grand old days of guitar making.